Air Down There Scuba ships all orders via UPS ground. 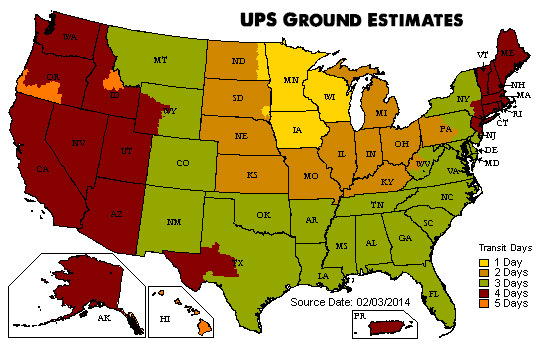 Estimated delivery time is based on the map below. If you are interested in purchasing tanks or other over-sized items, call us at (877) 76-SCUBA or (651) 482-0977. In-stock orders will be shipped the next business day (excluding holidays & weekends) and are guaranteed to be at your door within 7-10 business days to a US zip code. If you need your order in less than 7-10 business days, call us at (877) 76-SCUBA or (651) 482-0977 . PayPal accepts any credit card. You will not be charged for your order until it is shipped. Air Down There Scuba will only refund shipping charges when the carrier has failed to meet the delivery commitment and has issued Air Down There Scuba a credit. The decision made by a carrier regarding a claim for refund is final. Customer must be sure to communicate correct shipping address to Air Down There Scuba. Shippers will charge additional fees if an incorrect address has been provided. These fees will be transferred to the customer, only if the customer provided the incorrect ship-to address. Shippers will not accept special instructions from Air Down There Scuba, other than “Ship To” Name and Address. Exchanges through the mail are also subject to this shipping fee. If we are shipping your order out of state, it is not subject to sales tax. Minnesota residents will pay Minnesota State Sales Tax, as well as other local taxes at time of payment. Air Down There Scuba will gladly accept products for return or exchange within 30 days of purchase. All merchandise must be returned in new and unused condition, in the manufacturer’s original packaging, including manuals, blank warranty cards and any other manufacturer documentation/packaging. Include a copy of the original invoice with the returned item(s). If you return an item from an order that received FREE SHIPPING, the original shipping savings associated with the returned item(s) will be deducted from the refund amount. No returns on books, CD’s, DVD’s or software due to copyright laws. We will refuse all packages that are sent COD.